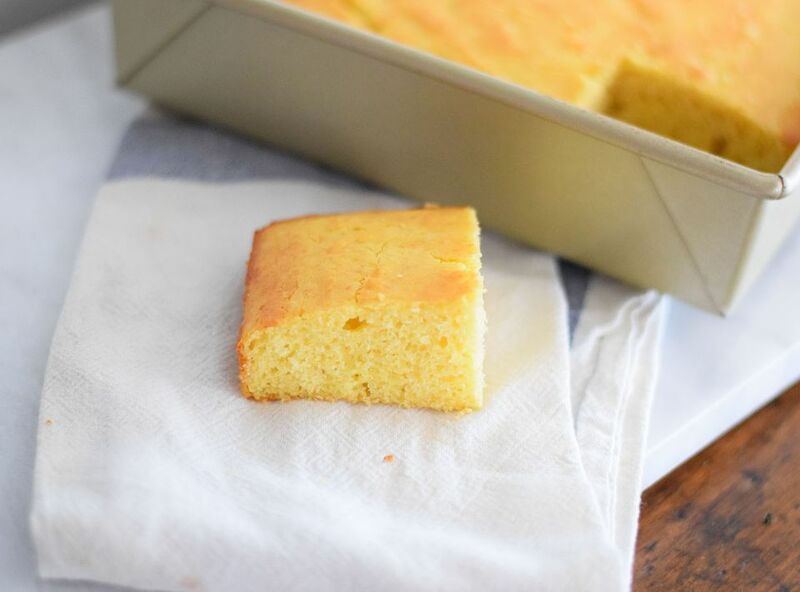 Nothing beats a warm pan of sweet cornbread. Slather on some fresh butter or jam and you're in heaven! It also goes along perfectly with a bowl of chili or baked beans! It's a super simple bread recipe and doesn't require any complicated ingredients or procedures! It bakes up pretty quickly and can easily be made ahead of time and frozen until it is needed! Cornbread can be sweet or savory depending on your tastes. You can use a combination of honey and regular granulated sugar, but you can substitute it either way and use all honey or all sugar if you wish. The buttermilk helps keep the cornbread soft and moist. If you don't feel like buying a whole container of buttermilk, just add in two teaspoons of vinegar to regular whole milk. The vinegar helps to create the flavor and texture of buttermilk, you can also use a little lemon juice and get the same result. Unlike other bread, like banana bread or coffee cake, you don't want to make cornbread in a loaf pan. You can of course, but you will get better results using a 9x9 baking dish or a cast iron skillet. We find that the cast iron skillet if it is well seasoned, provides excellent flavor as well as a hearty crust on the cornbread, especially if you grease the skillet with butter. You can replace the butter in this recipe for oil, but I find the butter provides much more flavor and a better, more delicate texture. Whisk together the cornmeal, flour, baking powder, sugar, and salt in a medium-sized bowl. In a large measuring cup measure the whole milk beat in the egg, melted butter, and honey. Incorporate the wet mixture into the dry mixture. Stir until the dry mixture is completely moistened. Be careful not to over stir as this will make the cornbread tougher. Generously grease a 9x9 inch baking dish with cooking spray or butter. You can also use a cast iron skillet, which helps create a great crust on the cornbread. Spread the batter evenly in the pan. Place the pan in the oven on a middle rack and bake for 20-25 minutes, or until a toothpick comes out clean.